I have no idea whether the closure of Tredyffrin Library from Friday until next Thursday is required to make needed repairs, or whether it’s a decision by the Township to cut costs. In any case, in a community where the average annual household income exceeds $100k, there is no justifiable reason to limit hours, cut valued programs and lay off the handful of paid staff unless residents contribute n additional $100,000 to close a budget gap. We already have. It’s sitting in Tredyffrin’s healthy fund balance. Use it. (Or raise taxes to cover the costs of keeping our libraries open.) People choose to live here for a number of reasons. Among them, the quality of life and the excellent schools. Both include access to first-rate libraries. Does anyone disagree that adequate library funding should be a top priority in our township’s 2015 budget? The Library is much like the Fire Company. They are both essential services that are heavily reliant on voluntary donations. If every family that uses the library sent $20 to $50 it would do a lot to ease the situation. OK, here’s an update re the library closing. The first floor carpeting and technology equipment was ruined as a result of a bathroom plumbing issue. The library’s insurance will cover the costs for repair, replacement, etc. In fact, work is already underway with the carpet, etc. and will continue during the upcoming week. This is a big project and the hope is that the library can reopen on Thursday but I suggest checking the website or calling to confirm before you go. On the $100K deficit situation, it is hoped that the immediate 2015 budget gap situation will be resolved. The library is a priority to the community and it is important that it remain open at its current level. Long range budgetary planning is key to the library’s future and its financial sustainability. Did someone above seriously just refer to the library as ‘essential’ as compared to the fire company? To determine ‘essential’ you probably need to ask some very important questions. The library is anything but essential. As it is today, it is an artifact of the past. What it costs to run vs the benefits is a negative proposition. There are things that can be done to make it a true resource center. Lower Merion has done this with buildings like the Luddington Library. The library in Strafford, design wise, is extremely inefficient. The construction was sub-par and the recent work was just as bad. Like many things in Tredyffrin, the library is another example of inefficiency and is a money pit. 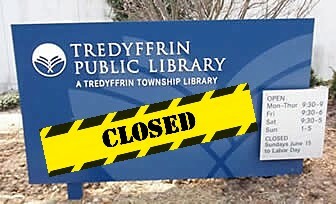 The Tredyffrin Library has reopened.